Two Chinese-American sisters—Miranda, the older, responsible one, always her younger sister’s protector; Lucia, the headstrong, unpredictable one, whose impulses are huge and, often, life changing. When Lucia starts hearing voices, it is Miranda who must find a way to reach her sister. Lucia impetuously plows ahead, but the bitter constant is that she is, in fact, mentally ill. Lucia lives life on a grand scale, until, inevitably, she crashes to earth. 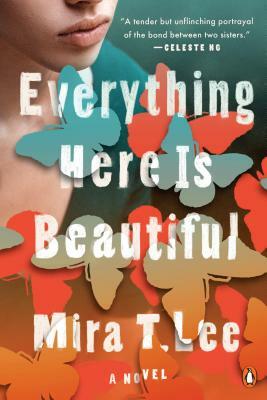 Everything Here Is Beautiful is, at its heart, an immigrant story, and a young woman’s quest to find fulfillment and a life unconstrained by her illness. But it’s also an unforgettable, gut-wrenching story of the sacrifices we make to truly love someone—and when loyalty to one’s self must prevail over all. Mira T. Lee's work has been published in numerous quarterlies and reviews, including The Missouri Review, The Southern Review, Harvard Review, and Triquarterly. She was awarded an Artist's Fellowship by the Massachusetts Cultural Council in 2012, and has twice received special mention for the Pushcart Prize. She is a graduate of Stanford University, and currently lives with her husband and two children in Cambridge, Massachusetts. This is her debut novel.